One of my artist friends asked to show how I go about creating my paintings. 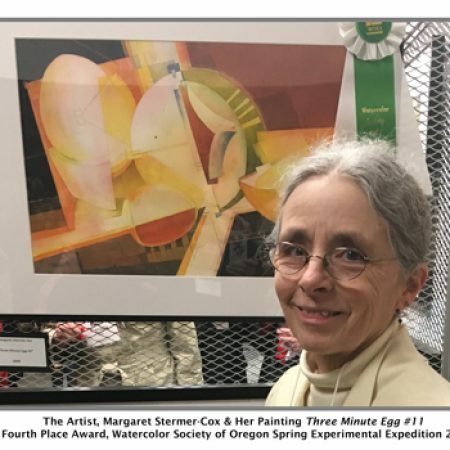 The suggestion came a couple of months ago while I was participating in a local watercolor critique group. I said “sure, no problem”. Now as I get ready to write about it, I wonder what do I say? On the one hand, its simple: do a drawing, enlarge, paint layer by layer. Stop when you’re done. On the other hand, how do you convey all the in-between work, like the inner dialogue and decision making, that happens while you’re busy creating? Its all the in-between work that makes the piece. And, its the in-between work that matters! 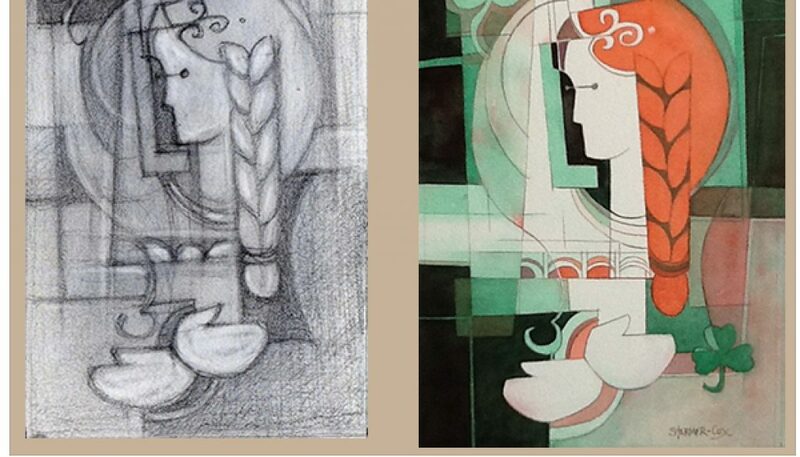 My process for creating paintings starts with a drawing. I usually work in a small sketchbook (5.5×8.5) that I can hold in my hand comfortably while I work. I use pencil, a kneaded eraser and a piece of felt to smudge. I draw, smudge, lift, draw some more. I push and pull the design on the piece of paper until I have something I like. 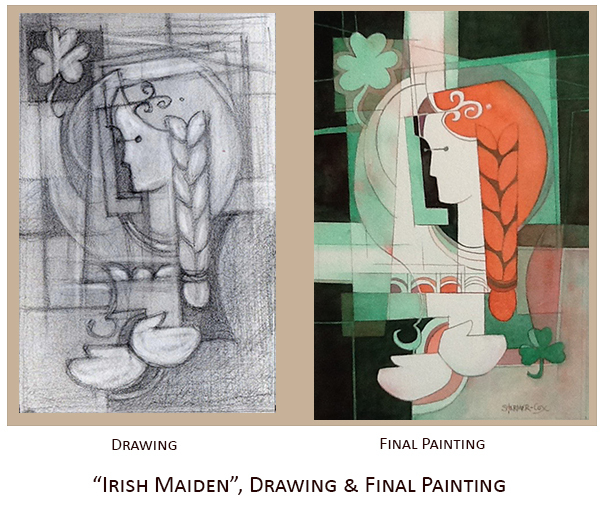 “Irish Maiden” started as a doodle in one of my smaller sketchbooks – smaller than usual. 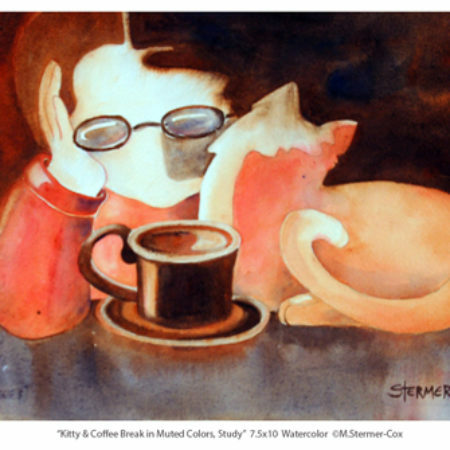 To explain, a local gallery (Rogue Gallery and Art Center) is having a show with an Irish theme and artist members can submit. I was playing around, seeing if I could come up with an idea. I was having trouble coming up with a design, so I switched to my “doodle” sketchbook. Sometimes, doodles are the best thing. They help me to get concepts down and ideas flowing. 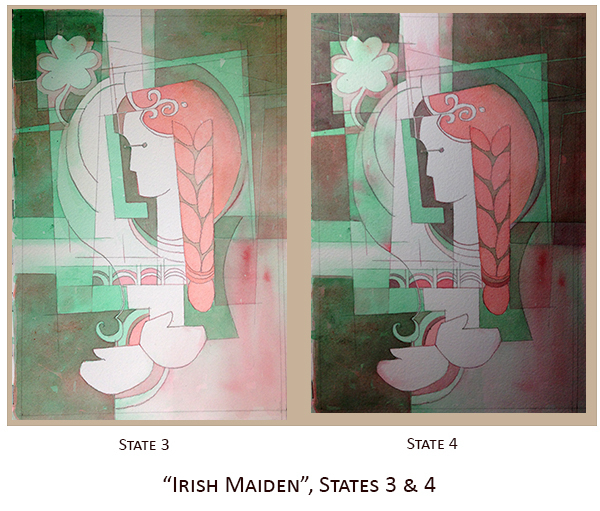 I thought it would be fun to combine some Irish symbols with a maiden done in a somewhat Cubist style. After pushing and pulling the pencil around, I started to get an idea! I went onto the internet to see what I could find about Irish symbols. I consulted nieces with Irish ancestors to get ideas. I was able to incorporate a couple of symbols into this particular design. The Shamrock. When I was a child, St Patty’s day was all about wearing a shamrock and green so I wouldn’t get pinched. Green was my favorite color, so that was easy. I always thought of the shamrock as being a good luck charm. But, it is much more than a good luck charm to the Irish people. The shamrock is the national flower of Ireland. Its meanings date back to the times of the Druids. I like the idea that the three lobes of the leaf echo the trinity: life, nature, spiritual; or mind, body spirit. Three Spirals; Triskelion or Triskele. Another ancient symbol the triskelion pre-date the Celts. It dates back to ancient Greece and Sicily. It shows up early in Celtic and Irish art. The spiral represents continuously moving forward. The triad refers to the things that come in threes again – past, present, future for example. I like spirals as a symbol of life cycles. The idea of always moving forward works for me. So, I created a crown for my maiden incorporating a variation of the three spirals. I do like the two perspective portrait or double face done Cubist style. I like to think of it as the face looking and not looking at you. Its one of my favorite devices when I want to draw an abstract face. 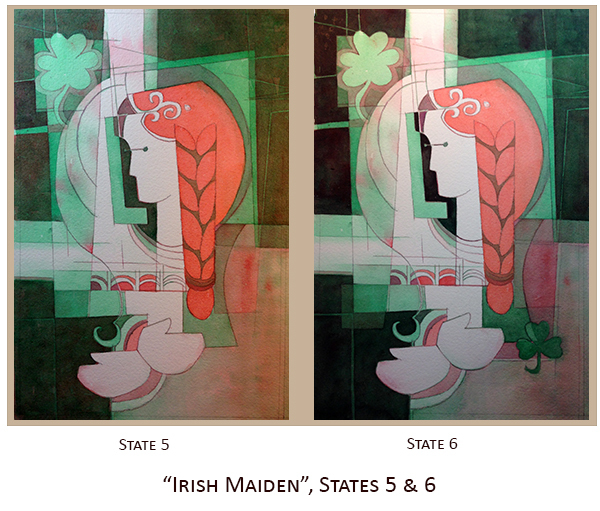 Its not particularly Irish; just fun to use in designing a painting! I like using a simple color palette based on opposing colors. 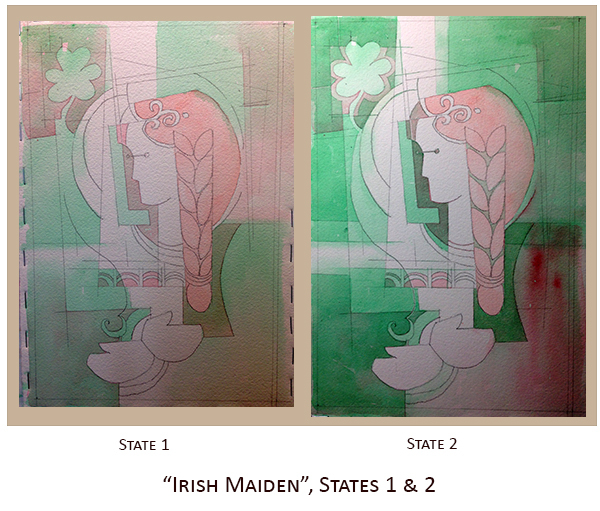 In this case, since I’m painting about the Irish, I used green and red. Green is the dominant color, in terms of percentage of area that is greenish. However, its pretty hard to miss the warm red braid! On a side note, I do tend to associate red hair with people with Irish or Scottish ancestors. The painting of the piece is accomplished by laying consecutive washes of thin, runny paint over a dry surface. I use soft sable brushes and lots of water. The surface must dry completely between washes. It is easy to pick up the paint from earlier layers, especially after many washes; not so desirable! But, if I watch what I’m doing, I can build up a nice, rich, colorful tone. Most of my washes are single color washes. I mix on paper, usually! I will say that my darkest darks are achieved by mixing a tub of strong dark paint. The darkest dark layer is close to one of the final things I do. The last few layers of paint are not particularly dramatic. As I approach the end, I will make any adjustments I need to the design. I will make small adjustments to color and tone. I feel a painting is “done” when it has achieved balance; when it has a feeling of wholeness. Put another way, if I add anything, or subtract anything, will I maintain the feeling of balance? 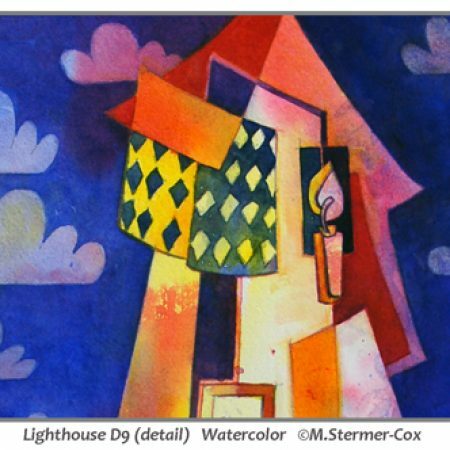 For me, I think its the designing phase that is the most important part of creating a successful painting. Its the place where the seed of excitement begins. I see my ideas start to become real. Its the impulse that carries me through to completion. Hi Raylee! Thank you for your comment and thank you for stopping by! OMGosh Peggy! Irish Maiden is GORGEOUS!!!!! I really appreciate how you distilled your process and also your honesty about it being a process of internal decisions and personal style. You are a TRUE MASTER. I love all of your pieces, always have. They are infinitely interesting. You are such an accomplished artist. It’s a pleasure getting a view of how you work. Hi Pam! Isn’t drawing creating infinitely interesting? No matter what form it takes, there is always something new to learn! I appreciate your compliments! Thank you!